Now after that short break to show you Kilbourne Grove from the air, we will continue on the ground. to my favourite euphorbias flowering. These have seeded everywhere in the garden, but I love them so much, I can’t bear to pull them out. love how the stems match the flower colour. My favourite camassia. leichtlinii, need to divide it and spread the love. Another camassia, this one is quamash. I have read the native Americans used to dig the bulbs and use them for food. love this shot, I am now using it as a screen saver. with the serviceberry or Amelanchiers just starting to flower. I think planting it beside some chartreuse and chocolate foliage will make the colour pop even more. Just so I do not bore you too much, I will show you the last half of May next time. I am sure we have all heard of Murphy’s Law. I had just been patting myself on the back for not having a cold since we moved to Barbados. I was a bit worried that I would pick one up every time we flew back and forth, but nada! Till this time… darn it! Just before we left, it struck, so there was no turkey dinner for me this Thanksgiving, hope yours was a lot better. Sorry for the lack of a post last week, I was still recovering. My two favorite seasons have always been spring and autumn. And now that I am living in the land of permanent summer, they are even more important to me. I am sure that everyone knows (after listening to it over and over again) how I feel about spring, but I do not know if I ever harped told you how much I love fall. I love when the nights start cooling down, and you can have a fire. When you can layer a sweater over a t-shirt and you instantly look more stylish, at least I do. When the food changes to heartier dishes, instead of salads. And when the leaves start turning. Oh the glorious colours they go. Eastern North America is renowned worldwide for the autumn colours and I certainly missed it when I loved in England. Not that they don’t have some lovely autumns, but there is nothing like a sugar maple in the fall. Not to mention sumac, wow could they be any brighter. Unfortunately we leave Canada before the height of the fall season, but I am starting to get a little preview. Looking forward to it getting a bit bigger. and Hakonechloa ‘Beni Kaze’ is changing colour. and ‘Full Moon’ is starting to do its stuff as well. And look at the mushrooms that have decided to make Kilbourne Grove their home, such a great harvest look. Luckily I don’t like mushrooms, so I look and definitely don’t touch! I will miss the full neon effect, but I am glad I was able to get a bit of a taste for fall. By the way, do you say fall or autumn? I read that autumn was English and fall, American, but I think it is a bit mixed up know. As a Canadian, heavily influenced by both England and America, I say both. I never really know where spring actually ends and summer begins. I know the date, the official date on the calendar. But in real life, it feels different. For me when the tulips and daffodils stop blooming, for me that is the end of spring. But this was advertised as spring, so I am going with it. I always look for any opportunity I can to take a garden course, I just love to learn. And taking one in an actual garden, instead of a classroom is a huge bonus. You are not looking at carefully composed slides, but at the actual plants, warts and all. So when a course was offered at Marion Jarvies garden, I made sure to sign myself up. Marion always has the newest and most interesting plants. A lot of growers will ask her to trial plants for them, this helps them decide whether or not they are worthwhile offering to the public. Of course, I see plants that I want, and then find out they are not available yet, or would be out of my budget, at least until they have been on the market for a few years, oh well. She has quite a few varieties of Cornus, but these 2 really tickled my fancy. Cornus ‘Venus’ is the largest flowered variety. These blooms are huge. It really makes an impact from far away, unlike my smaller kousa chinensis. Also making an impact from further away is Cornus kousa ‘Lemon Ripple’. Gorgeous yellow and green leaves will certainly add a stunning contrast in the garden. I wish I could have purchased this one as it was for sale, but we were taking the bus to Kilbourne Grove, and Ian did not fancy sitting with it in his lap for the journey, I can’t understand why! I have longed for one for years, and finally, this spring, on a visit to Lost Horizons with teza, I was able to purchase one. Look at how white the leaves are, a lovely contrast to the weeping Cornus beside it. Of course it will be a few years before mine is as statuesque as this one, but I am willing to wait. Cornus alternofolia ‘Argentea’, and Marion also has this one. It can be the Holy Grail for gardeners in North America, difficult to find, and very expensive if you find it, but an amazing tree. Japanese maples are a highlight in this garden, and she has many forms. My favourite is this one. I am going out on a limb here, as I forgot to pack my notebook with the name in it, but I am pretty sure it was ‘Koto No Ito”, Strings of a Harp. I love the contrast of the two different sizes of leaves, and look at it with the Berberis, gorgeous. Hopefully you will see this combination at Kilbourne Grove one day. Another gorgeous Japanese maple is “Geisha’. 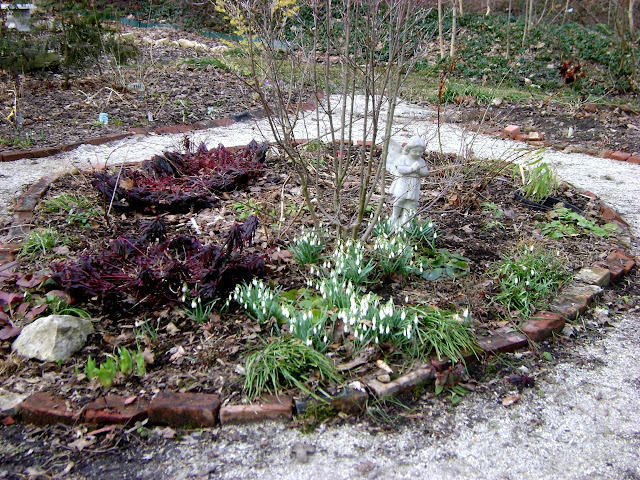 one planted in a bit more of a shaded woodland setting, beside ‘Peaches and Cream”, and the other with more sun. 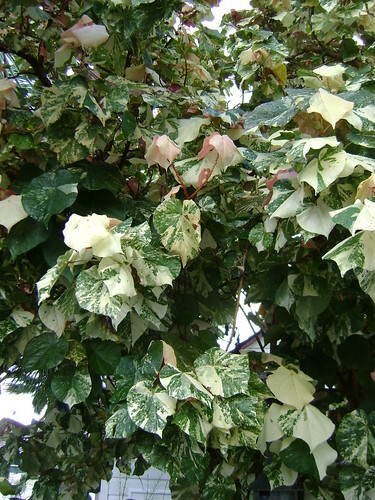 it is also quite pink, but has a contrasting edge on the leaf, where ‘Geisha’ has a contorted dot of green. this one has some colour on it in the spring, can anyone tell me if these are both shirasawnum? also ‘Golden Rocket’ another amazing berberis. Another tree I have been toying with the idea of purchasing is the Fringe tree, Chionanthus virginicus . Marion has just planted one and I look forward to seeing it mature in the years to come, certainly not a common tree. When I had stayed with my friend Barry, I noticed a beautiful Juniper ‘Gold Coin’ (which also seems to be known as ‘Gold Cone’), then I happened to see it in Marion’s garden as well. This one is tiny, but Barry’s is over 6 feet tall. Once you notice something it seems you see it everywhere and you wonder why you were blind to it for so long. And since I seem to be on a golden foliage kick lately, I am certainly adding one of these to my (ever-growing)wish list. hope I can achieve a similar effect at Kilbourne Grove one day. When I was at the front of her garden I spied this shrub. It was only released a few years ago, and I have never seen it in real life. Viburnum plicatum ‘Popcorn’ grows in tiers like other double file viburnums, but the flowers are ball like instead of flat. This part was interesting for me. looks amazing. I happen to have five that were free from work and I have always been wondering what to do with them, mine are a bit rangy. She clips it twice per year as the new growth is the most sensational! Great idea. It is such a small world (in a way) in the blogging and gardening community. Because of Kathy at Cold Climate Gardening reviewing Brian Bixleys book last year, I got a chance to see his garden for the first time. And it was well worth it. 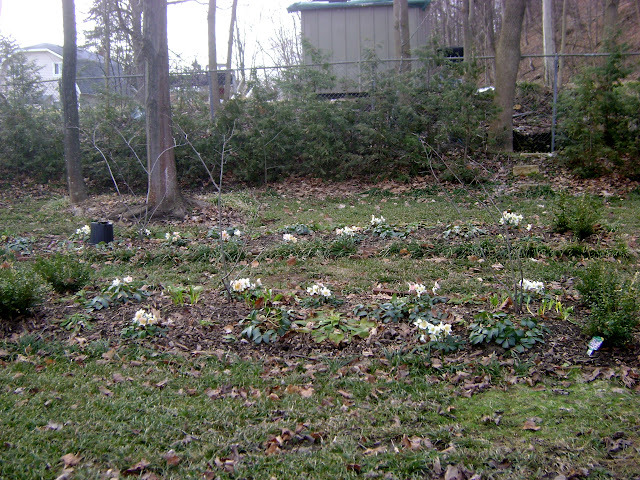 Brian loves spring, and is trying to educate gardeners, how many plants there are that flower early. Most gardens, when they open to the public, open later, usually mid to late May, but Brian opens Lilactree Farm a couple of times earlier then that, and when I visited last year on April 24th, I picked up lots of valuable ideas. This year, I visited on May 6th, and all the early spring bulbs that I had lusted after were finished for the year, but my heart filled with other lusts. And I want to show you a few. Anemone nemerosa is new to me. I certainly grow a few (ok, quite a few) varieties of the fall anemone, and I love the amemone coronarias that we sell at the flower shop, anemone blanda, is another of my favs, but I have not paid to much attention to the spring ephemerals. There is certainly quite a few, but nemerosa, is such a gorgeous one. Coming in white, soft blues and pinks, it is certainly easy to place anywhere in your garden. but this is Pallida, a very soft yellow. Brian did tell me the name of this very tiny trillium, but my head was spinning by this point and I do not remember, isn’t it sweet. My one cimicifuga looks pretty lonely now, this is the way to plant them. Wish I knew the name of this yellow magnolia, it is gorgeous. The nice thing about the yellows, other than the obvious, (the colour), is they are later flowering. So they usually avoid the frosts. I have some Virginia bluebells in my garden, but I think I need more. Perhaps I shall transfer some fo them to my berm, and hope, one day, I will have a show like this. Speaking of blue, is there anything like a gentian. One of the only perennials that was at Kilbourne Grove when I bought it, was a primula veris in the grass. I carefully dug it up, and transferred it to my garden, and it has been divided many times by now. After seeing this, perhaps I should transfer him back to the lawn. I do not know how I missed this piece of garden art on my last visit, just a reminder always look up, instead of just down, you never know what you might see. I remember when finding this plant was like finding the Holy Grail. You should see the number of them here, mind-boggling. Now, one of the best parts, the species peonies. I have a weakness for peonies, my grandmother always used to tie the first blooms to my birthday present. The species are not only gorgeous in flower, but the leaves are amazing. He has a large number of varieties, including mlokosewitschii, veitchii, tenuifolia, and those are just the tags I could see. 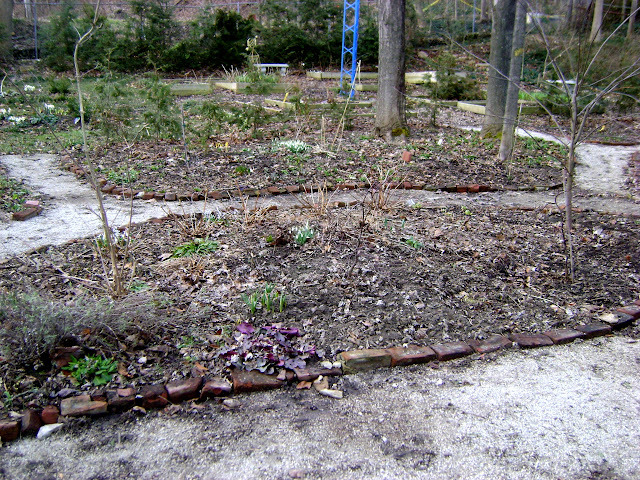 When I was looking at my photos from last April, I realized there was quite a difference (approx 3 weeks) between where the garden was in April 2011 and April 2112. So I thought that I would share a few with you. You can see how much larger the helleborus are this year, finally bulking up, and I found a few seedlings when I was weeding, yay! Usually I coppice these willows, but they (obviously) started leafing out really early this spring. I think I might leave them alone this year and see how they look in the fall. Hmmm, do not know what to say, but the big difference (to me) is the path. You can see where I filled it in on the left hand side ,and (hopefully) you can see a bit of an opening on the right hand side now. 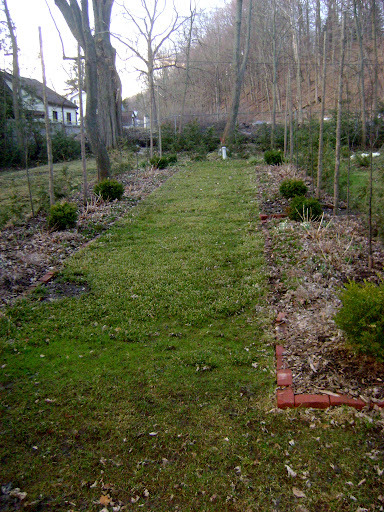 Last fall I moved all the shrubs/perennials that were in the way. 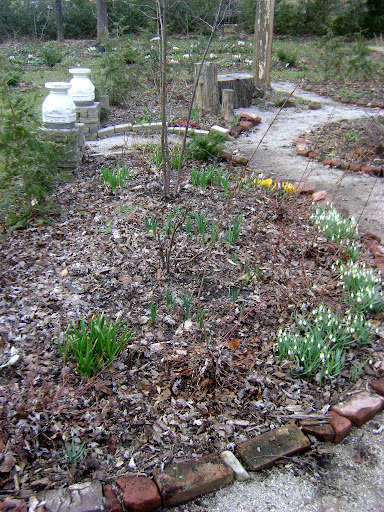 I was just waiting for the bulbs to come up, and they will be moved on this visit, and (hopefully) the path gravelled. This is the bed where my mums memorial tree is, last year was the first time the Cornus kousa flowered, hopefully it will again this year. Well other than the muscari are all flowering earlier this year, I think you can see the other change here, lol. I was reminded how much I like this plant when I saw it (and found out its name) at the Barbados Horticultural Society Open Garden on the weekend. 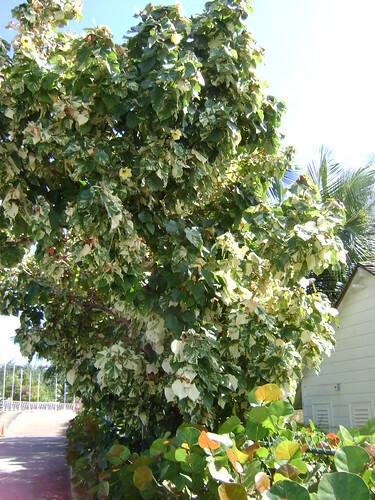 There are quite a few of them in the complex where I live, but no one could tell me what the name was,(although I suspected a hibiscus), so I was pleased when I found out it was called a Mahoe (at least here in Barbados). However the latin name was not available at the time. So of course, I Googled it. Yay for Google. 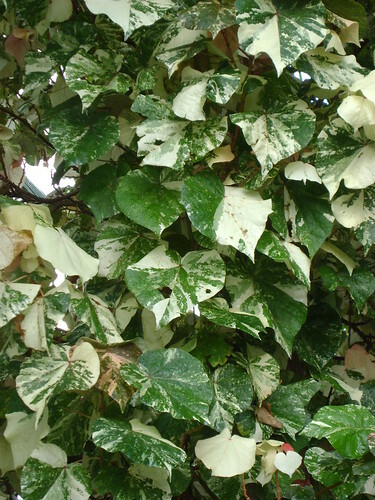 Although it came up with a number of choices, Hibiscus tiliaceus ‘Variegata’ seems to be what I have been eyeing. Although it is called a Mahoe here in the Caribbean, Google turned up a number of different names, depending on where in the world you live. 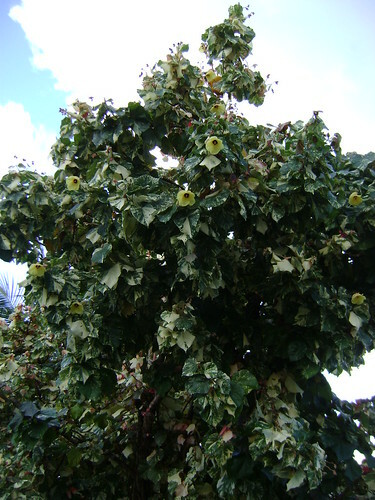 From Cottonwood or Cotton Tree in Australia, Parau in Tahiti, Vau in Fiji to Hau in Hawaii. Not surprising it is a salt tolerant shrub, will thrive in any soil, and grows 20-25 feet tall. 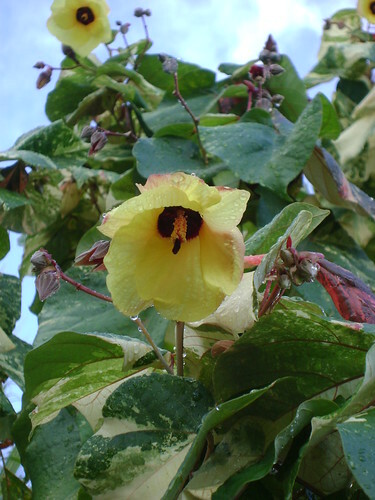 It has interesting flowers that start out creamy yellow with a dark red centre and darken to an orange/red colour, before they fall off. while the new growth is a soft pinky colour.